We’re deep into August…and that means fantasy football! Most fantasy drafts are right around the corner, and the time to prepare is now, if you haven’t started. The New York Giants offense is expected to be explosive, and there are a number of offensive contributors that can lead you to a fantasy football championship. But when is the right time to draft the likes of Odell Beckham Jr. and Saquon Barkley? You might want to pull the trigger on Barkley or Beckham in the first round, but understanding where they’re generally being drafted is crucial in order to not reach for one of them. Disclaimer: Metrics based on a 12-team league. Yes, the Giants have a future NFL Hall of Fame quarterback in Eli Manning, but let’s be honest, the Giants offense starts with Odell Beckham Jr, especially when discussing fantasy football. Last year, if you had the 5th pick in the first round, you probably couldn’t sniff Odell, but with his ankle injury, his average draft position has dropped. According to Fantasypros.com, Odell Beckham, on average, will be selected around the first pick of the second round. Getting him anywhere after the 10th pick in the second round is a major steal. The numbers he can put up when healthy can win you a Fantasy Football championship. Also, there doesn’t seem to be any lingering issues from his ankle injury. All camp reports are positive and optimistic that he will burst back on the scene. However, as good as we know Beckham can be, there’s no need to reach for him. Picking him with the fourth or fifth pick is irresponsible considering the running backs available at that spot (Ezekiel Elliott and David Johnson most likely). Over drafting players is a sure-fire way to hurt the depth of your team in the long run. Believe it or not…on average Saquon Barkley is selected higher than Odell Beckham Jr. His average draft position of 6th overall may seem high for a guy who’s never played in a regular season NFL game. So why should Fantasy Football teams by in? For starters, Barkley is going to have every chance to succeed in a Pat Shurmur offense. As the No. 2 overall pick in April’s NFL draft, there shouldn’t be any easing into the season for Barkley. Shurmur wants to run the ball. His Vikings offense had 456 non QB attempts last season for 1800 yards. 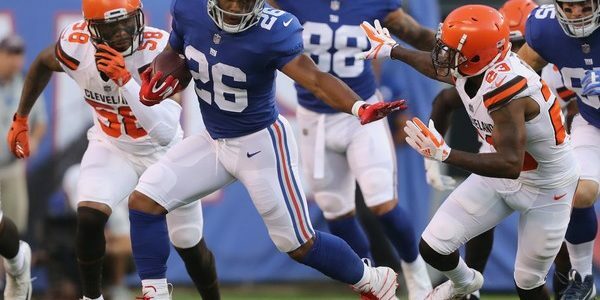 The volume of carries for Barkley will be there from the start, hence the opportunities to put up big numbers. Barkley has been touted for his supreme route running skills. He will create mismatches all over the field when paired up against linebackers and safeties in the passing game. Besides rest, there’s no reason to bring him off the field with how versatile he is. He gives you and your team more touches and more opportunity to go the distance. During your NFL Fantasy Draft picking Barkley anywhere from the seventh pick to the end of 1st round is ideal. It is not advised to pick him over the likes of Ezekiel Elliott or David Johnson. If that was in your plan, we recommend rethinking it. Barkley’s hamstring injury is minor, but if you’re picking at the top of your Fantasy league taking the safe route makes sense. Go with a proven top-end running back like Gurley or Bell, otherwise take Antonio Brown over Barkley.